It had been a long week, and Dean was sitting in the kitchen of the bunker with the radio playing quietly and a glass of whiskey in his hand. He had just finished up a hunt with Sam; a wendigo, the first one in years. Sam had gone to bed, but Dean&apos;s mind was still racing. So he stayed up, listened to some music, and drank the nightmares away. He let his thoughts wander, and suddenly found himself thinking of Cas. There were many times this happened, and Dean never let his thoughts linger on the subject for too long. But this time, his brain had the reigns and he didn&apos;t want to take them away. He kept thinking of everything Cas had sacrificed for them, how many times he had saved Dean&apos;s life. He smiled softly, his head crowded with the feeling only those who are in love with someone they can&apos;t have could truly know. He went to take another drink when he suddenly heard those all to familiar footsteps. 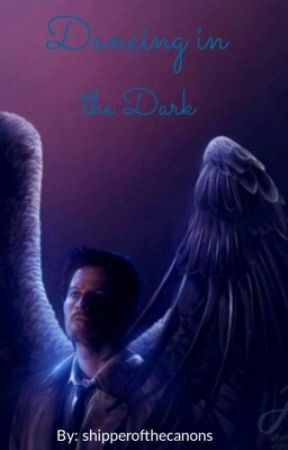 He turned to see Cas, his angel, leaning in the doorway. Dean stared at Cas, drinking in his silhouetted features. The way his trench coat hung, the way his hair always seemed to be perfect, no matter how messy it was. It was almost more than Dean could take, when suddenly Cas moved and sat across the table from him. Then he broke the silence, speaking softly. "Hello Dean." His gruff voice sent shivers down Dean&apos;s spine, and he loved it. He nodded in response, and Cas continued. "How was your hunt? Sam seems tired enough, why are you still up?" Dean grimaced, and poured Cas a drink before speaking. "It was long. And you know why I&apos;m up." He raised his glass just a little, to indicate it&apos;s mere existence. "I can never sleep right after a hunt." Cas nodded, sipping his drink. They sat there for a bit, when the song changed to something slow and soothing. Dean thought for a second, then swallowed his fear. He stood, turned the song up just a bit, then extended his hand to the angel. "Dance with me?" It was more of a statement than a question, but it got the point across. Cas stood and took Dean&apos;s hand, allowing himself to be pulled close to the hunter. "I don&apos;t know how to dance though." They stood for a moment, close to each other in the stillness. "I&apos;ll teach you. Just follow my lead, you&apos;ll catch on." He moved Cas&apos;s hand to right spots, and they swayed slowly across the floor with the soft music in the background. For the first time in a long time, both of them were at ease. Their thoughts were only of each other, the way they seemed to fit so well together. Both wondered why they had never done this before. The music swelled, and the smile on Dean&apos;s face grew. The song ended, but neither cared. They kept on dancing without a care in the world. Suddenly, Dean was gripped with the overwhelming urge to kiss Cas. His smile faltered a bit, and he bit his lip. 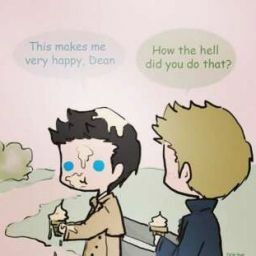 Cas looked at him, puzzled by the sudden change in behavior. "Cas, before I do this, I just need you to know one thing. I don&apos;t remember when I knew, maybe it was in that barn all those years ago, or when you walked into that lake, or even in purgatory, but I&apos;ve known for a while. Castiel, I-" he was was cut off by Cas putting a hand on Dean&apos;s chest and looking into his eyes with a smile. "I know Dean. I feel the same. Have for a very long time." They smiled at each other for a very long moment, and then Dean snapped. He stopped dancing and grabbed Cas&apos;s face, smashing their lips together. Cas was shocked for a second, and then melted into the kiss. They stood their, intertwined as they had desperately wanted to be for years. The music changed again and a song neither of them knew was gently playing in the background. They broke apart, their foreheads resting together, the smiles on their faces bigger than they had ever been. "I love you so much Cas. I always have. I&apos;m sorry I couldn&apos;t tell you earlier." "I love you too Dean. In all these years, you&apos;ve been the home to me that heaven never was."